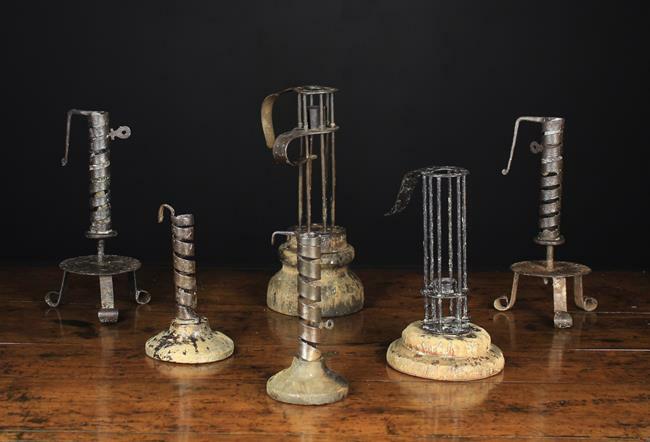 Three Pairs of Wrought Iron Candlesticks. Two 18th century style stable lights with 'birdcage' stems and rustic wooden bases 11½ ins (29 cm) and 8¼ ins (21 cm) in height. 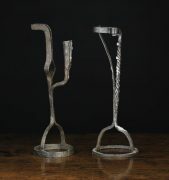 A pair of early 19th century coiled strap candlesticks with rotating candle adjusters above a circular sheet iron platforms raised on three scroll feet, 10 ins (26 cm) in height. Another pair of early 19th century coiled strap sticks on treen bases, 7 ins (18 cm) in height. 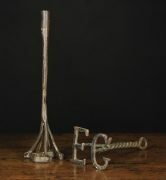 An 18th Century Wrought Iron Floor Standing Adjustable Rush Light on a sprung frame sliding up a hook-ended stem with mid height knop and rustic treen base, 40½ ins (103 cm) in height. 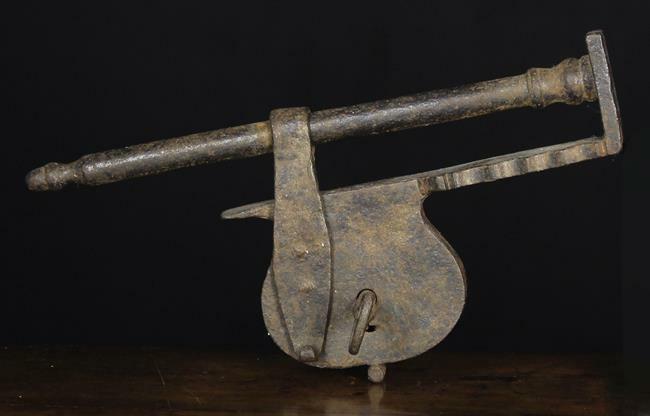 A 17th Century Iron Bar Padlock, 14 ins (36 cm) in length. 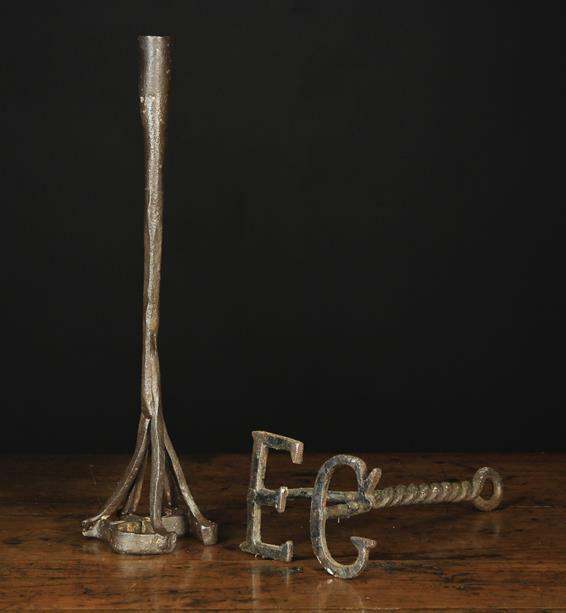 Two 18th/Early 19th Century Wrought Branding Irons; one with a candle socket on square section stem above conjoined initials HR, 16 ins (40 cm) in height. The other with initials EG on a twisted twin bine stem with lopped end, 11 ins (28 cm) in height. 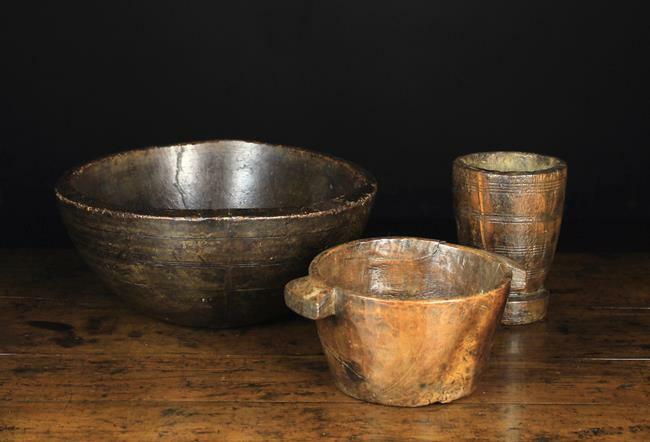 A Late 17th/ Early 18th Century Dug Out Treen Mortar with ring turned sides and raised foot 7 ins (17.5 cm) high, an 18th Century dug out tub vessel with lug handles 5 in (13 cm) high, 8 in (20 cm) in diameter, and a 19th century turned treen bowl, 6 in (15 cm) high, 14½ in (37 cm) in diameter. A Rustic Offertory Box. The lid attached by iron loop hinges to a plank back, pierced with a coin slot and secured by a lock & key to the form. 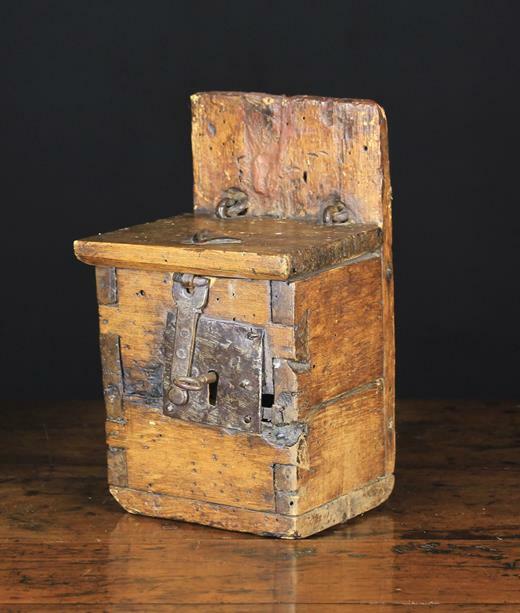 The box receptacle having through dove-jointed front corners, 9½ in (24 cm) high, 5¾ in (14.5 cm) wide, 5¼ in (13 cm) deep. 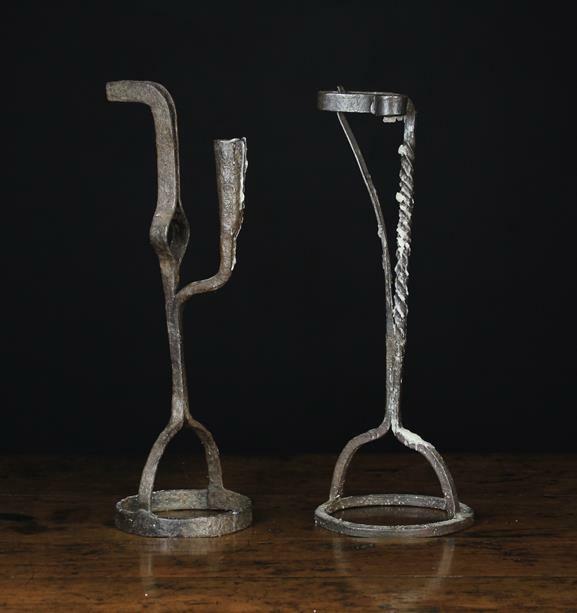 Two 18th Century Scottish or Irish Wrought Iron Peermen with candle sockets, on ring bases 15 ins (38 cm) in height. 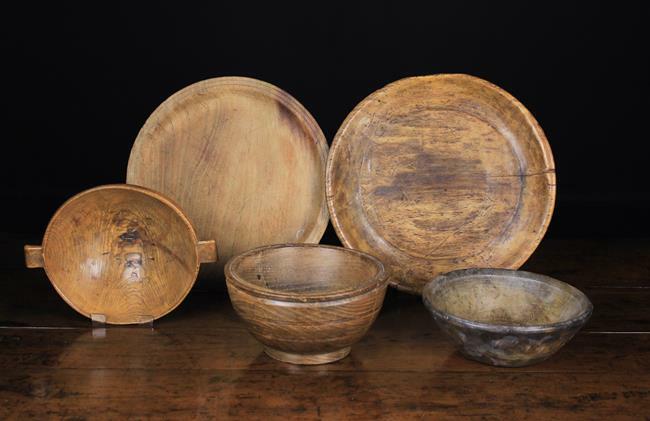 Three Antique Treen Bowls & Two Plates. An ash bow with lug handles, 2½ in (6.5 cm) high, 9 in (23 cm) wide. 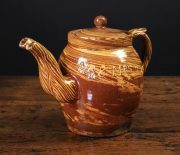 A turned beechwood bowl approx 7½ in (19 cm) diameter. A bowl with ring turned sides and raised foot 7½ in (19 cm) high, the plates approx. 10½ in (27 cm) and 11½ in (29 cm) wide. 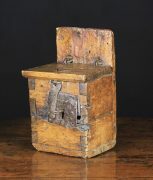 A Small 18th Century Boarded Oak Box of rectangular form. The lid on iron strap hinges. 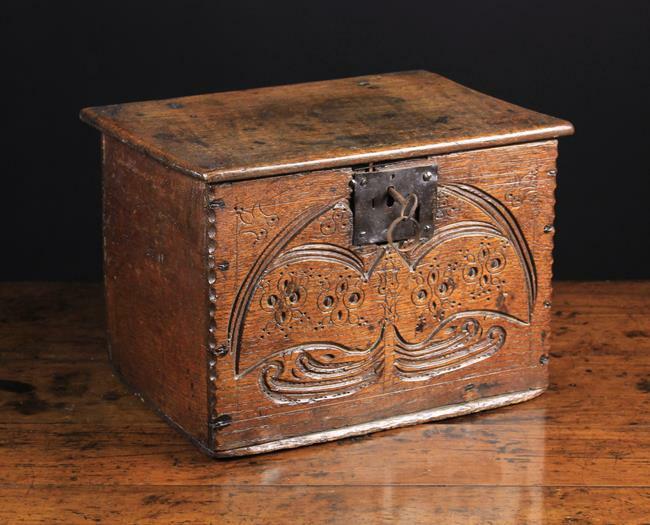 The front with board gouge carving and decorative punchwork, chip carved ends and a replacement lock & key, 9½ in (24 cm) high, 14 in (35.5 cm) wide, 9¾ in (25 cm) deep. A Late 19th Century Agate-ware Slip Glazed Twin-spouted Teapot with inscription 'Mr & Mrs Taylor Nov 11 1899, 8 in (20 cm) in height.